Anything to do with the blog or the main website. New plots, new adventures of real life! It’ll be posted in due time. There’s a lot and I don’t want to put it all at the same time! Posted on December 28, 2011 Categories Website UpdatesLeave a comment on What’s on! 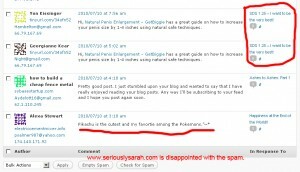 Posted on July 13, 2010 Categories Website Updates3 Comments on Oh silly spammers! I have some content that I wish to share BUT I am not writing it down yet cause aaah. It’s the last day of March. DEADLINES of some submissions so we’ll have them in April. I’ll do a quickpress post here. Of some local book reviews. Of where do these writers lurk around here. But only in April. SEE YOU THEN. 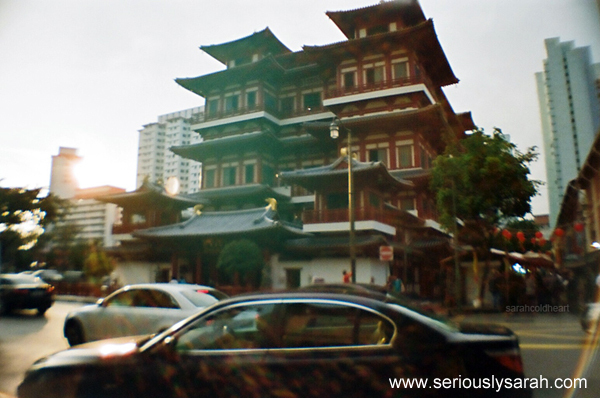 I’d probably have my Sarah Does Singapore post done up tonight so it’s scheduled to post itself on Monday but just a little notice as it will get slow for this week or so. I’ve actually got a draft of episode 2 for Versus Undead but it’s been stalling because of a certain factor that has been plaguing me since late last year! I AM GOING TO A WISDOM TOOTH OPERATION TOMORROW. With that said, it’s under general anesthesia and I’ll post on it under my Random Encounters section or SDS. I haven’t figured which cause it’s like an adventure. Eh, I’ll figure out which since there’s people curious on how it’s like and all too. One of the main factors is that one must have cute underwear. NO ONE TOLD ME THIS, I HAD TO FIND OUT MYSELF. Posted on February 4, 2010 Categories Website UpdatesTags adventureLeave a comment on Commercial Break. It will be postponed to Sunday/Monday since I had mucho work today to post it up. Firstly, yeah. I have no idea what is going with this. 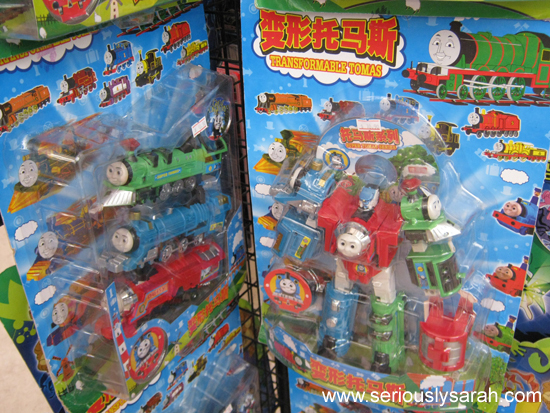 It’s a Thomas the tank engine transformer. Secondly, they typoed Thomas to Tomas. Just wanted to post that up because it’s just so weird. ANYWAY! A minor interlude. I’ve been posting events because they’re faster than my book reviews! I got a stack load of books from the Singapore Writers Festival the other month and yes… It’s quite a lot. I’ll post them book by book in December. That’s after Nanowrimo anyway. Posties on TGX and other events later in the week. No posties today on account of GRADUATION DAY. If you’re using Google Reader and seeing spam, click this title! OKAY, I got notified by one of my friends who uses Google Reader that my entries will look like SPAM if you’re using it. Click the the thumbnail to see. So anyway, this is a NEW issue that came up with WordPress/Google Reader. Apparently it just happened a week ago in my search to see if anyone else had it with their RSS feed being hijacked or something. The spam doesn’t show if you’re using anything ELSE besides Google Reader. Heck if you check the exact address of my blog feed: http://www.seriouslysarah.com/blog/feed/ , it doesn’t show. At the moment, since this is new, I can’t fix it since I’m not some major hacker person or whatever. So I hope you guys who’re using RSS feeds to check my posts will understand and not use GR or instead click the main post to see it since I TOTALLY am not talking about viagra (correct post shows up only if you click the post even if preview is spammy). Well, okay, I MIGHT write about it since romance week starts next week but in any case, it wouldn’t be bunches of random words strung together. Hopefully WordPress/Google might find a fix for this issue soon. With that, I will give you a haiku. Posted on June 27, 2009 Categories Website Updates2 Comments on If you’re using Google Reader and seeing spam, click this title!